I would like to illustrate a number of things regarding BYOD (bring your own devices). I travelled the school in the last two weeks and talked to students about our rights, responsibilities and privileges regarding technology use in elementary school. Working together with a team of students we have created the look and started the language for posters to describe our “Eastwood TECHNOrms” these will be delivered after the break and need to be posted in our rooms. 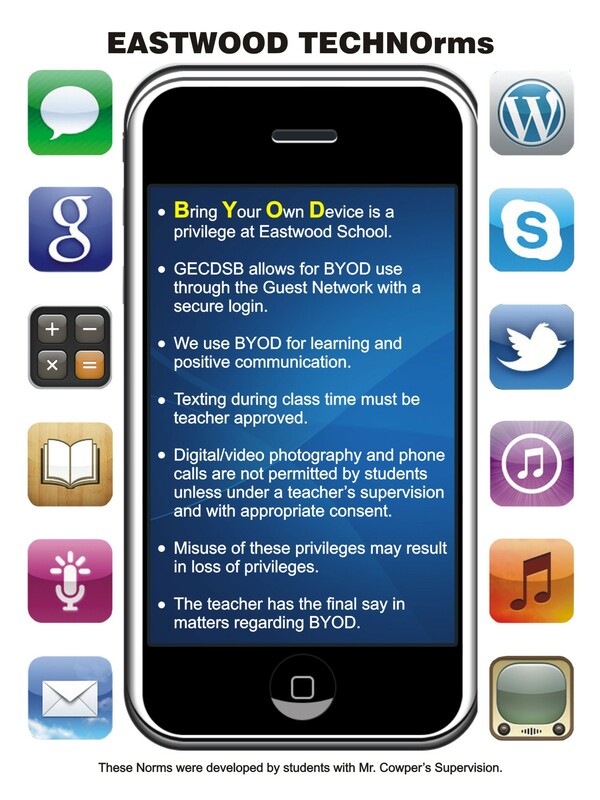 Our board has a policy that encourages the use of BYOD in schools for educational reasons. We encourage students to use tech to engage in safe and appropriate communication and learning. You as the teacher have the final say for the use of these in classrooms. BYOD is a great way to engage in learning, questioning, polling, communicating and microblogging (twitter). Students do use texting as a form of communication during their nutrition breaks and recesses. If you feel there is something inappropriate happening you have our support in being sure the students are being appropriate and maintaining our trust. If you feel you need further clarification from the student please use discretion and the support of administration to help. Cellphone use is not encouraged or allowed unless you are standing beside the student before during and after the phone call and they have asked your permission to do so for appropriate school related reasons. The office must be aware of phone calls made to a students home by a student. As adults we always model and teach positive and appropriate online citizenship. It is incumbent upon us to explicitly teach online behaviours, pitfalls, do’s and don’ts through our literacy block and media literacy activities. These lessons cannot be avoided, dismissed or ignored. If a student has not put their device away when asked it is appropriate for you to ask for the device and then it be returned at the end of the lesson. If a student chooses not to turn it over please bring this to the attention of administration at your next free moment. We are here to support you. The Ontario College of Teachers: Professional Advisory use of Electronic Communication and Social Media. There are literally millions of resources to be used that could harness the power of web 2.0 and social media. There are a number of teachers that are successfully experimenting and implementing web 2.0 stuff. Ask me for details. My son has been whispering I’m sorry from the wing back lounge chair for almost 30 minutes. At least I hope that is what he is whispering. Could be he is still repeating that I didn’t buy him a lego set. This might be the largest Starbucks I’ve been too besides Seattle’s flagship. Yet I’ve only seen the first 10 feet. I havent even ordered my triple venti latte yet. This is something as, I admit, I am addicted. No, instead I am using this time to help my son learn a lesson about being grateful. Remaining calm in the face of such acrimonious dialogue is a skill I did not learn from my father. I am sure generation Xers can relate. My dad did not reason or coddle. You with me so far. While my Dad cultivated my philosophy of high expectations and trust above all else it is my life and skills as an educator that have most certainly saved me as a parent. For instance, I have written this entire post during “the episode” as my daughter calls them. I distance myself from the behaviour, refuse to own negative energy and resist fully the temptation to take events like this personally. The last element being the hardest as Gavin is my flesh and blood. “You just don’t like me, that is why you didn’t get me legos or a birthday present.” You see he even makes stuff up to try and engage me. Not happening. 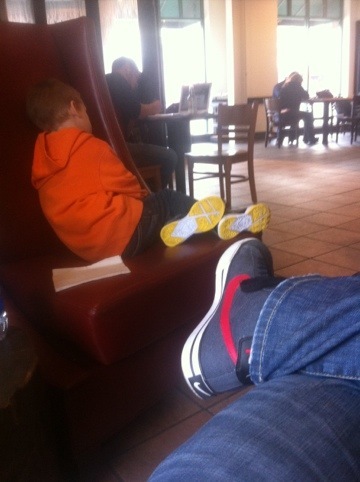 At this point in the timeout I am surprised the barista hasn’t charged us for the bazillion Starbucks napkins Gavin has used to wipe his nose. This relationship, between parenting and teaching, is the most important aspect of my life as a father. I share this everyday with students, parents and teachers. It is the one aspect of my personal life that I cannot seperate from my work life. In Loco Parentis or in this case In Parentis. I got an apology. I got a hug. More than that Gavin figured it all out when he saw me typing on my iPhone. “Yes Gavin.” I replied stoically. It seems Gavin has my desire to help others too.